VANT are currently one of the UK’s hottest acts, famous for their frenzied live shows, political engagement and love of football. Their most recent single ‘Fly-By Alien’ featured as Annie Mac’s hottest record in the world, and they have just completed their first ever headline tour. 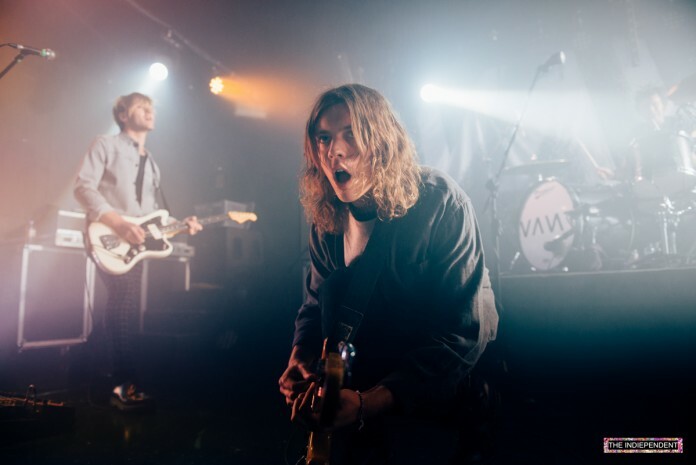 I was fortunate enough to catch up with frontman Mattie Vant and guitarist Billy Morris at their first Manchester headline date. So this is your first time touring as the headline act – how has this tour compared with previous ones? Mattie: We’re in control. I guess that you know people are there to see you as well. I mean, we did do a few headline shows last year but it was all when we were building up. This feels like the first proper tour, and over half of it sold out or is close to being sold out. So it’s good to know that the kids will be into it. And old people as well. The reaction has been phenomenal and this tour has also been our first time headlining in Europe as well. That was pretty special. Billy: It was amazing to go over there and see this really positive response. Mattie: But yeah, every show has been pretty chaotic. Can’t hope for more really. As long as there’s no injuries! Do you plan on your shows being so chaotic? Mattie: Well the thing with our shows is… obviously there’s a structure to them, but we try and keep it as fresh as we possibly can. Mainly for our own entertainment really. When you’re touring quite a lot – I think this is the 21st date of the tour – you’ve got to kind of keep your sanity levels up. Billy: Which they kind of dipped in Sheffield. Mattie: Yeah, we had a couple of days of almost cracking. Mattie: There was a bit of Enrique Iglesias involved. I’ve been listening to the five songs you currently have released for about six months now; when can we look forward to some new stuff coming out? Mattie: [It’ll be in May that] the new single will be out. We can’t tell you which one though! But it’s exciting, ‘Fly-By Alien’ has been out a couple of months now and it’s had a really great response, and helped us move to the next level. I think the next track is going to help us take it up another notch and push us through to the summer. There’ll be plenty of new stuff coming along soon, all of which is building up to the album, which’ll be out later this year or at the latest early next year. It’s exciting for us as well because we’ve been living with these songs for a while now and getting the opportunity to share them with everyone else is one of the most exciting parts of being in a band. Considering your latest single was picked up by Annie Mac as her hottest record in the world, do you think you’re getting a bit more mainstream traction now? Mattie: A little bit, yeah. It’s good because I wouldn’t think- I’m not naming names, but there’s not many rock bands that have got that. Obviously you’ve got Wolf Alice and Slaves, but I’d say we were slightly heavier than those guys, and I love what they do, it’s just nice to be seen tapping into a bit of the market that hasn’t been touched on. We’re heavier but we’re not on the “screamo” side of things. So it’s good that it’s getting recognised and the BBC are playing it, and hopefully they’ll continue to support us. Alongside your deep, philosophical political views, you’re also known Sunderland fans. How do you think the season has gone for you? Mattie: To be honest I was very pessimistic the last couple of weeks, but I think we’ve got a good chance now. We’ve got the best chance out of Norwich and Newcastle anyway. Billy: At least it’s exciting. I’m a Chelsea fan so for me it’s an absolute horror, really. I’ve become kind of invested in the fight for survival though. Mattie: I think if we get relegated I’m not going to be that bothered. Billy: The glory of the Premier League relegation! Bringing it back to politics: Mattie, you’ve said that rap is the only genre saying anything really important and that rock has become separated from politics. Why do you think that’s happened? Mattie: I think because it got commercialised. Indie stuff was massive in the early noughties, but then you had a lot of bands jumping on the bandwagon. To be honest I don’t think a lot of bands have talked about the kind of politics we talk about since the early nineties. You have to look to more alternative music or rap to hear about that sort of stuff and it’s something I’m comfortable talking about as a lyricist. We’ve also been honest as a band from the start, so we’ve allowed ourselves to talk about it. Which might have been harder if we’d started off writing songs about how many drinks we like to drink in the pub. The video for your latest single ‘Fly-By Alien’ is a bit kooky. What’s the story behind it? Mattie: It’s a collaborative effort. I can’t take any credit for the conception of it. We did look at the basic themes of the song, about the imminent demise of the planet and all that stuff, and put a lot of those themes in there. There’s a dead cow circling around and volcanoes going off. I think it visually ties in with the songs message, and to be honest we didn’t really know what the hell [the animators] were going to do. It was amazing when the results came out. Hats off to them. How do you feel about the recent passing of Prince? Mattie: To be honest I was shocked but I wasn’t really devastated. Obviously there’s never going to be anyone quite like him again. I can’t wait to see into his vault! But I think I was more gutted by Bowie. Is 2016 making you more fearful as mere mortal musicians? Mattie: Well they were twice our age so unless we develop drug addictions and blow our heads off I think we’ll be fine. That said, we’re fucked anyway because apparently the world’s ending according to our tour manager. Something to do with magnetism. Billy: Like the atmosphere being weak against solar winds and the poles shifting or something. Mattie: So yeah, that’s an exclusive. VANT have finished their tour but you can catch them at a number of Festivals including Reading and Leeds this summer.